Yep, the paint leaked through in multiple places, and it peeled off your base layer of paint in others. Back to square one, what in the world am I going to do with this piece now? This happened to me more often than I’d like to admit, and although I got pretty good at managing that painter’s tape to get clean lines, it wasn’t until I started using these four tricks that my lines straightened up. This post contains affiliate links marked with an asterisk. Read more about our disclosure policy here. 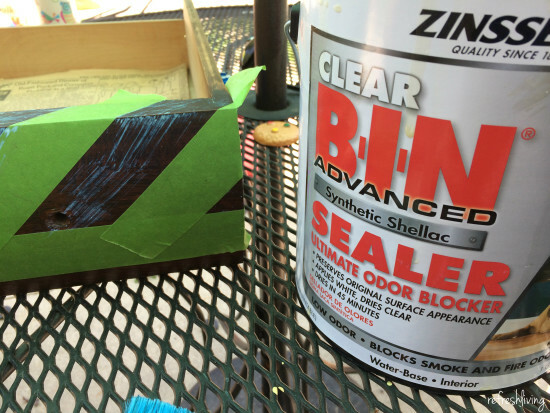 Tip #1: Use Frog brand painter’s tape. Thankfully, FrogTape* is the only green painter’s tape I’ve ever seen, making it super easy to pick out. They have tape for delicate surfaces, which works great if you’re adding a pattern or stripe to a piece that’s already painted. (Speaking of previously painted pieces, be sure your base coat is DRY – like 2-3 days dry.) When you lay your tape down, be sure to run your finger along the edge that will be painted. Remove your tape as soon as possible – it works best when your paint is still wet. If you are painting multiple coats, remove it as soon as you’ve finished painting the last coat. 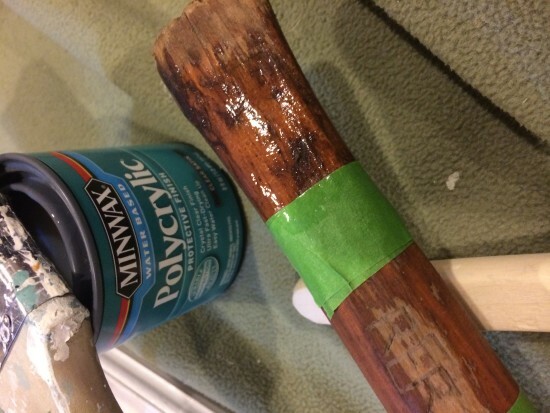 One last painter’s tape tip – don’t rip it off like a band-aid. Take your time and slowly remove it. Tip #2: Use a foam roller. I’ve had the best luck with stencils and stripes when using a foam roller* . 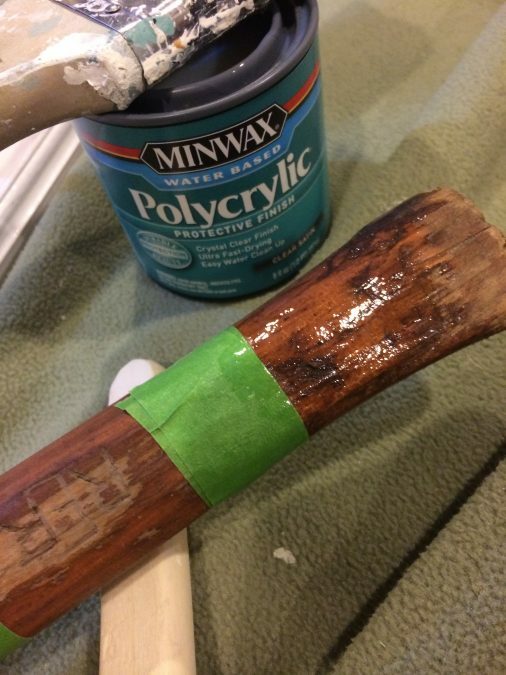 If you do need to use a brush, make sure to brush over the tape, and then into the area you need to paint. In other words, don’t brush towards the tape, brush over and away from it. Tip #3: Less paint is more. You really don’t need as much paint as you think you need, especially when painting with stencils. If I’m using a foam roller or pouncer, I always dab/roll once or twice on a paper towel before painting it on the surface. The less excess paint on your roller, the less that will seep under that tape. 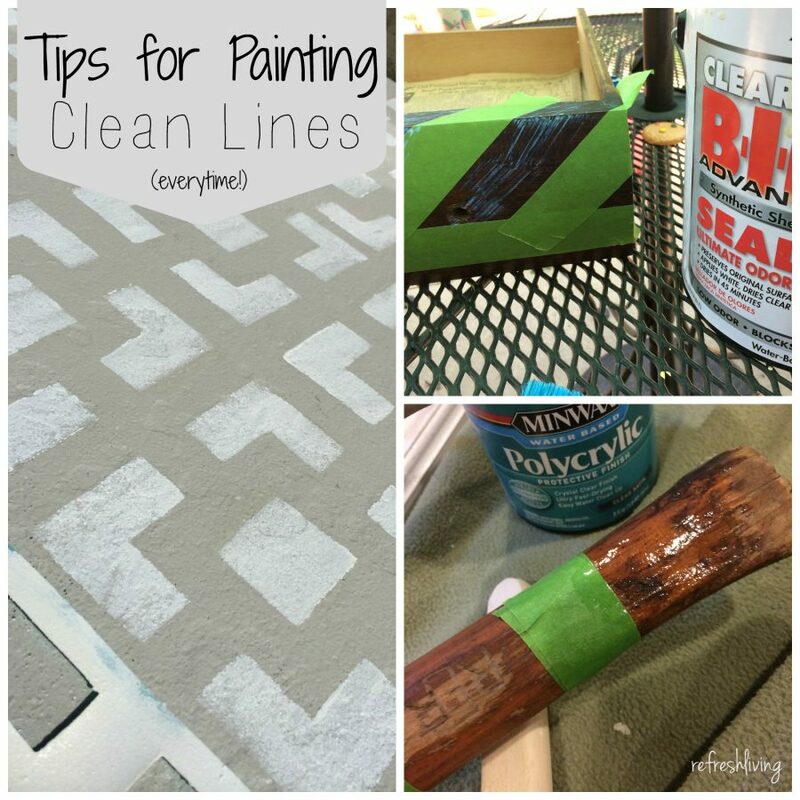 Tip #4 (the BEST tip of all): Use a base coat of paint before painting your pattern. If you can’t do any of the tips above, you must use this tip. This one is, by far, the game changer. 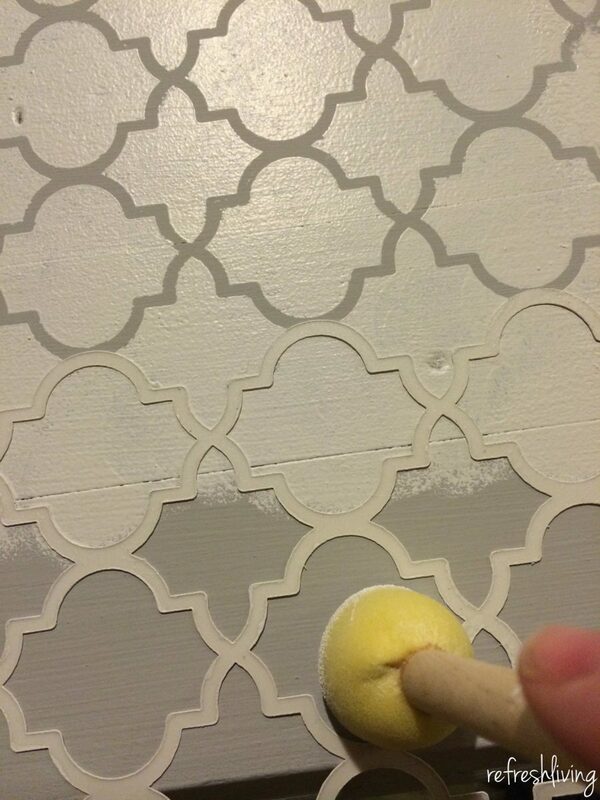 The first coat you paint over your stencil or paint won’t be in your pattern color, you’ll actually want to paint a color that won’t be seen later. That way, if there is any bleed through, no one will be able to tell! I painted this boat oar with a base coat in white, laid down my painter’s tape for the lines, and then painted the stripes with white. After letting them dry to the touch, I painted the blue color on top. 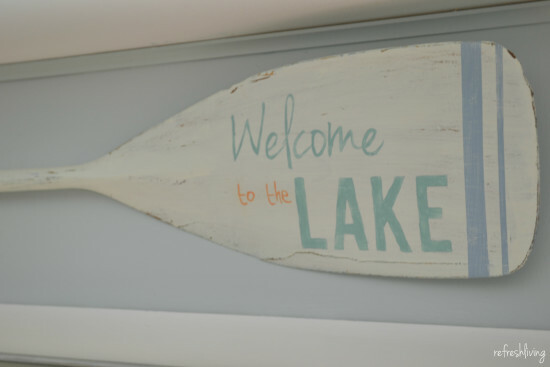 In you’re interested in how I painted those letters, you can check out this post or this one, too. If you’re painting a pattern on wood, you’ll want to paint a thin layer of clear shellac or poly-acrylic, let it dry, and then paint the pattern color. I learned this tip from Reeves over at The Weathered Door. If you’ve ever seen her work, you know that this girl paints perfect lines every time! Let me show you proof of this here miracle trick. 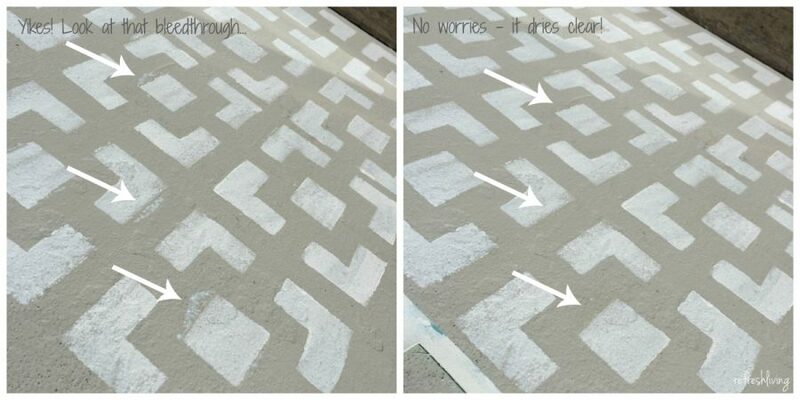 I recently stenciled my front patio, and the stencil was super curled and driving. me. crazy. If I wouldn’t have used shellac before painting the white, it would have been disastrous. The image on the left shows the shellac before it dried (shellac does on milky white and dries clear). You can see all the places that the shellac seeped under the stencil. The image on the right is about 2 minutes later, after the shellac dried. I didn’t do anything to it to get rid of that seepage – it’s clear, and no one will ever see it, so you just need to let it dry. Give one (or all) of these a try and I promise you’ll be patting yourself on the back next time you remove that painter’s tape or stencil! Yes, I totally agree – I made the mistake the hard way!